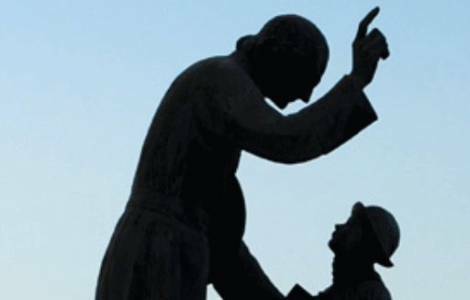 Ars sur Formans (Agenzia Fides) - “As head of the Congregation for the Evangelisation of Peoples, I call on Saint Jean-Marie Vianney to intercede for the seminaries and the clergy in our young churches in mission territories entrusted to our ecclesial care by the Holy Father”. With these words Cardinal Fernando Filoni invoked the special intercession of the saintly Curè d'Ars for the clergy and seminarians of the young Churches. The Cardinal said this in his homily during a solemn Mass at which he presided in the parish of Ars, France, on Thursday 4 August, the day when the Catholic Church commemorates the patron saint of parish priests all over the world. Ars was the village where for forty years Saint Jean-Marie Vianney exercised his ministry celebrating Mass, hearing confessions, teaching catechism and caring for the poor, with evangelical simplicity which drew vast crowds of faithful, while never obscuring the working of God’s grace. In his homily Cardinal Filoni recalled the source of the spirituality of the Curé d'Ars, which makes of Saint Jean-Marie Vianney a valid travelling companion also for the priests in our world of today so different from the France of the 18th century. “Here” said the Cardinal “numerous priests comes to find inspiration for their priestly life and I myself have come as a pilgrim recalling the years of my seminary formation in preparation for the priestly life when we looked to the the saintly Curè d'Ars as the prototype of the parish priest”.